Indietracks - an indiepop festival: Indietracks nominated in the European Festival Awards! Indietracks nominated in the European Festival Awards! Thanks again to everyone who voted for us in the recent UK Festival Awards, and a big congratulations to La Casa Azul again for winning the Critics' Choice award for his magnificent headline set! 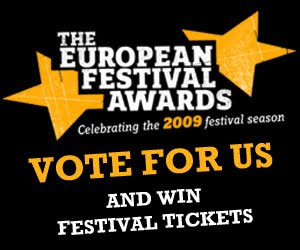 If that wasn't exciting enouugh, we have now been nominated for Best Small Festival in the European Festival Awards. To vote for us, visit the awards website, scroll down and click on the "Best Small Festival" category, entering your details. Voting closes on December 16. Everyone who takes part in voting is eligible for the draw to win two VIP tickets to every winning festival from the awards! After voting closes, the final shortlists will be announced and people can vote again to decide the overall winners in each category. The final winners will then be announced at a ceremony in Groningen, in the Netherlands in January - exciting!